Here is an interesting tidbit; you could be camping in the wild and have wolves very near without knowing they are present. This is the case because among themselves, wolves use body language as the main source of communication with each other. Over time, wolves have developed very clear postures and behaviors because this body language helps the pack live with each other in relative peace. When there is less aggression among pack members, the pack hirearchy holds together and helps to insure the survival of the pack. Body language is the method to let every wolf know the pack rules. Observing tail and body language is a great way to understand a pack hierarchy and we will cover those basics now. A wagging tail is a sign of a wolf being relaxed. If the tail is slightly drooped and the tip is out, it shows an even more relaxed wolf. If the tail is in a drooping / hanging position the wolf is super relaxed. From a submissive standpoint there are two obvious tail positions. The first is known as a half tuck, the tail tucks between the legs but does not tuck up against the stomach. When this happens the wolf is showing a form of submission to a dominant wolf. It the pack hierarchy this tail tuck can be submissive to any wolf that is higher up the ladder, not just to the alpha. When the tail is tucked all the way between the lefs with the tip under the stomach and with a arched back, the wolf is usually in extreme feat, usually a more dominant wolf. So how do you know when a wolf is going to attack something? The tail is stiff and completely horizontal. This could also be a sign that the wolf is on the hunt. Within a pack there are generally two types of submission we can observe: passive and active. Whereas active submission almost always involves contact, passive submission puts the lower ranking wolf in a very vulnerable position because they lay on their back or side and expose the chest and abdominal region. Since wolf packs have a pecking order, this behavior is not limited to being submissive to only the alpha but to any wolf in the pack that is of higher ranking within that pack. You can see active submission in the form of crouching, tail tucking and even the licking of the higher ranking wolf’s muzzle. 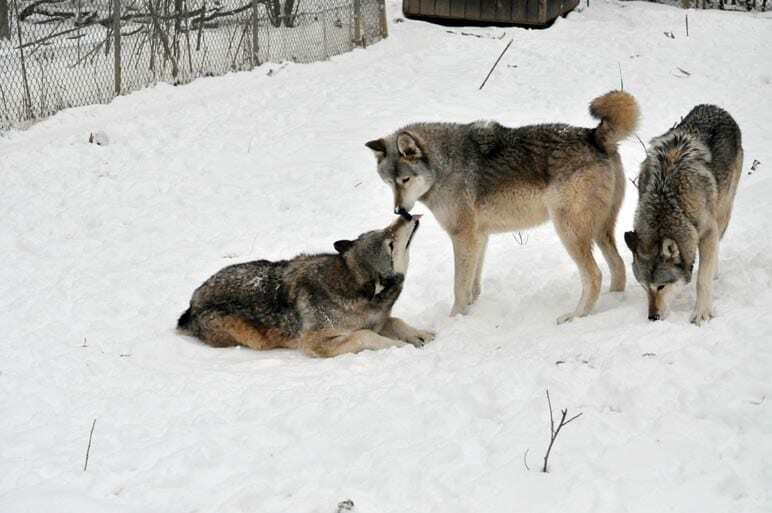 As adults this form of behavior is usually a sign of respect to the higher ranking wolf, the submissive wolf is accepting their place in the pack. These wolf submission behaviors have a very beneficial affect on the pack as a unit. By following and accepting their roles within the pack, the wolves within a pack usually results in the pack having fewer fights among themselves thus preserving the pack as a unit.